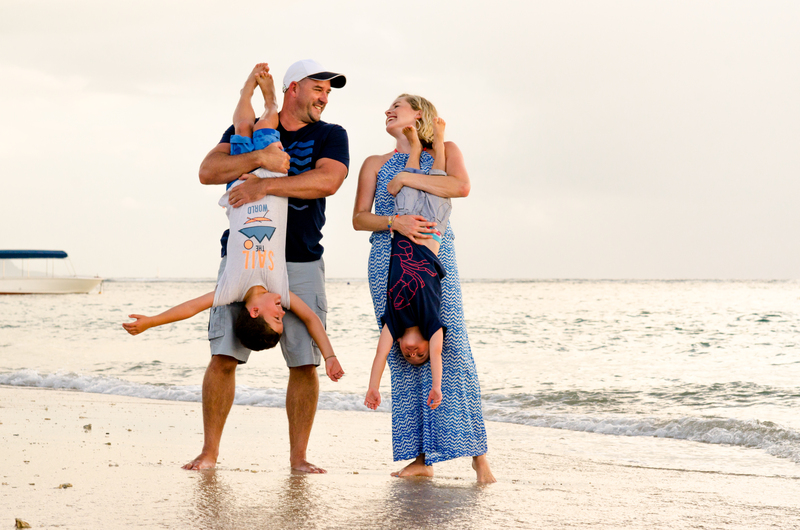 When you have two active little boys, the sun is setting quickly on the last evening of your holiday, and you want to take some special family beach portraits, all you can do is take each moment as it comes and then laugh! This is exactly what Greg and Angela did on their photo shoot with me. Their delightful boys, Oliver and Luke, posed a bit and played a bit then, flashed a quick smile at me before scampering off to their next shenanigans. We weren’t long into the session when both boys had succumbed to the appeal of the lapping waves at their feet. Luckily Angela had dressed them in “water camouflage” clothing so for the photos, it is barely noticeable. Needless to say, I loved it; What a delight to do a family shoot filled with such laughter, fun and mischief. Kids make me laugh, it as if their motto for life is: why do anything normally. Why calmly walk down a pier when you can strut your stuff with your latest dance moves? Why sit boringly on the sand when you can roll with the waves? I think my personal favourite from this session is little Luke, curled up on his mother’s lap, tired now from his afternoon’s games. I really thought he might nod off to sleep while the sun set and we wound down our photo shoot. It was a great fun to meet you all, I look forward to catching up next time you are in this part of the Indian Ocean. My kids are now back at school after the Easter holiday, I can’t believe we are already into the second quarter of the year. Although, I must say, it feels like we are only now actually starting the year as the first term was so broken up with public holidays and school closures due to rain storms. It does feel good to go back to a little bit of normality again.